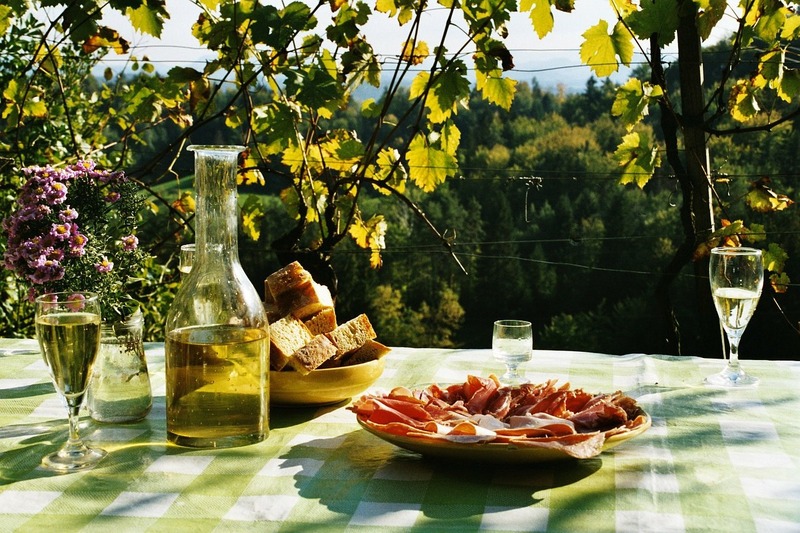 Perhaps no one enjoys outdoor dining quite as much as the Italians. 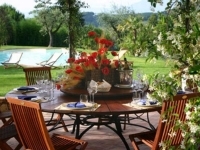 In Italy, dining outdoors has long been embraced as a relaxing way to unwind after a long day. Here in the United States, with the warm weather of Spring upon us… and before you know it, the heat of Summer just around the corner — dining alfresco is on most peoples minds! For a great alfresco spring or summer Italian meal, start with a refreshing white peach summer bellini with prosecco and white peach purée – invented at the famous Harry’s Bar in Venice. A tomato, basil, and mozzarella salad is always a crowd pleaser. Drizzle chicken and fish with olive oil and lemon for a fresh, light flavor. Colorful veggies lightly dusted with Italian seasonings and extra virgin olive oil to bring out their natural flavors. Throw together a classic Italian pasta salad with fresh ingredients from your farmers market. These are such simple things, but such full of flavor for seasonal pleasure! Whatever your menu is, be sure to select a delicious wine to accompany the meal. Pinot Grigio, Pinot Bianco and Friulano wines from northeastern Italy, are aromatic white wines with crisp acidities that provide thirst-quenching refreshment during warm and hot months. Meanwhile, from the other end of Italy, Falanghina, Greco, Fiano and other whites are extremely versatile, elegant and food friendly. These wines from Italy’s sunny south pair well with virtually any seafood and also are just plain delightful for alfresco sipping. While these are all whites, there are many warm weather appropriate reds. Italian reds that work best in warm weather have fresh fruit flavors, and are light to medium-bodied. The lower the alcohol, the better. Anywhere between 12 percent and 13.5 percent is ideal. They should be vibrant, with good acidity. The Piedmont region has some great summer reds such as, Grignolino d’Asti and Freisa. The Veneto region has Bardolino and Valpolicella. And everyone young and old, will love ending their perfect meal with a delicious and refreshing gelato or a Sorbetto-On-A-Stick. If you must remember one thing, the simple key to perfect alfresco dining is always fresh seasonal ingredients. So whether in your own backyard, or at an outdoor bistro — gather your friends or family for an enjoyable evening of good food, fine wine, and great company while dining alfresco — Italian style.